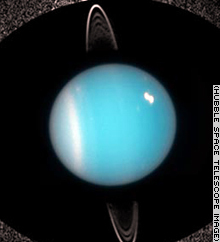 CNN) -- New images from the Hubble Space Telescope show the planet Uranus has two additional moons and two faint rings never observed before. The new moons, which were named Mab and Cupid, bring the total number of satellites orbiting Uranus to 27. Astronomer Mark Showalter of the SETI Institute and his colleagues were not looking for new moons or rings when they submitted a proposal to take deep exposures of the planet with Hubble's most advanced optical camera. Rather, they planned to study the 11 previously known rings and several moons embedded within them. Once they saw the new moons, they re-examined images that the Voyager 2 spacecraft took when it flew by Uranus in 1986. The two moons are clearly there, but no one recognized them at the time. "The discoveries all came from Hubble," Showalter said. "The Voyager results came because it's much easier to find something you are looking for." The Hubble images also confirmed the existence of another moon, Perdita, which was first identified in the Voyager 2 pictures but had eluded telescopes ever since. Many moons of Uranus are named after characters in Shakespeare, and these new moons follow suit. Mab is named for Queen Mab, who is the subject of a famous speech by the character Mercutio in "Romeo and Juliet." Cupid is best known as the Roman god of love, but he also turns up as a character in the lesser-known play "Timon of Athens." The name Perdita comes from the play "A Winter's Tale." All three moons are very small. Perdita is the largest, measuring about 16 miles across. The moons are orbiting in the same vicinity as the newly discovered rings -- outside the previously known ring system but closer to the planet than the five largest moons. "Sometimes you find things you aren't looking for," Showalter said. "No one thought this region of Uranus was very interesting." As it turns out, that region is turning out to be very interesting, because the orbits of the moons within it are chaotic. The system is so unstable that Showalter thinks the moons will collide and smash each other to bits one day, though probably not for a million years or so. The private, not-for-profit SETI Institute, whose major mission involves the search for extraterrestrial intelligence and the study of life in the universe, also has some involvement in other astronomical research projects.